I am passionate about co-creating spaces that support individuals and groups engaged in socially innovative process work. I am learning to use deep listening and graphic recording to “make the invisible visible” in order to facilitate change on the individual and systems level. Working visually is about helping groups see what they are saying and to see themselves within the system. It’s about engaging in more effective, efficient and innovative thinking. Why are visuals so useful? Visuals help many people better understand, integrate and remember information, make new connections and problem solve. Visuals speak to our emotions, inviting reflection and interaction (think social media). As this article from Inkfactorystudio.com explains, “sixty five percent of people simply learn better visually… the brain processes visuals 60,000 times faster than text…. when visual notes are incorporated into a conference or meeting, most of the audience will be able to understand what’s being said more quickly.” Of course, visuals don’t work for everyone (e.g. those with visual impairments or those who can get easily overwhelmed by visual stimuli), and practitioners should keep this in mind as we develop our new skills in this arena. As Becca shared here last month, there are a variety of methods for creating visuals in real time to assist group processes. Generative scribing is one of the newest, and has deep potential. Generative scribing grew out of and continues to support a community of practice called “Presencing” or “Theory U.“ This framework has influenced CORE since its inception. It offers tools and practices to transform business, society and self through a three-stage practice of observation, reflection and prototyping accompanied by inner leadership work. At the heart of Theory U is the idea that my success in my endeavors depends upon the source from which I operate. The “how” of it has everything to do with the quality of my attention as well as my intention and my ability to cultivate the inner conditions of presencing: an open mind (curiosity), an open heart (compassion) and an open will (courage). I learned about Theory U as a student in Edgewood College’s Social Innovation & Sustainability Leadership program, and during the fall of 2016 I began participating in u.lab, a free annual online MIT course which has evolved into a global community of more than 100,000 people from 185 countries. It was here that I first laid eyes on the profound visual summaries that Kelvy Bird created on huge blackboards with various colors of chalk. Since my introduction to this work, I have been on a learning journey, exploring various visual modalities. In Spring of 2017 I began “putting myself out there” as a visual practitioner. The process of summoning up the courage to do this work has been huge! And I have practiced listening more and more deeply. At my graphic recording gigs in 2017, I did scribing at levels 1 and 2; mirroring what I heard and making sense of content. Each time has been so different because my skills have evolved over time. Yet, I have noticed a heart opening every time I have scribed. 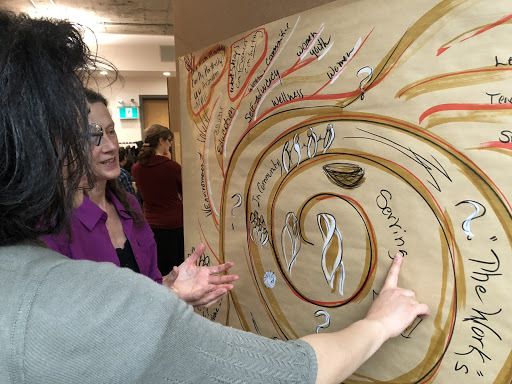 Through our partnership with CORE, Julie Swanson, Nola Walker, and I had the opportunity to attend Kelvy Bird’s Visual Practice Workshop held in Toronto, Canada this April. We learned that generative scribing takes visual work to deeper levels by going beyond the superficial. It gets to the essence of things by co-creating powerful containers where deep listening can flourish and generative dialogue can be sustained to support participants in uncovering an emerging future of possibilities that are not mere echos of ideas sourced from the past. 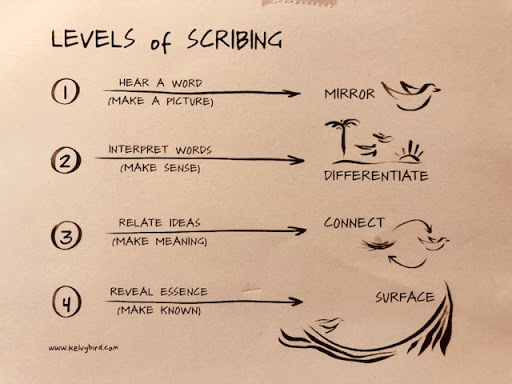 I have yet to experience scribing at this “level 4.” But at the two gigs I had in the month after returning from Kelvy’s workshop, I was able to show up with deeper confidence and capacity, capturing levels 1 and 2 and moving into Level 3 – relating ideas and making meaning. YAY! As I practice presencing and embodying this open heart more and more, I yearn to be of service at this deeper level of generative scribing, helping groups generate new possibilities. I look forward to getting to scribe with groups who are working collectively at a presencing level in this way, so that we can go deeper, further and faster together. Stephanie Steigerwaldt is an “artist-in-residence” with CORE, along with her business partner at What’s Possible Now, Julie Swanson. Expand your consciousness and cultivate your capacity through a taste of what generative scribing offers at CORE’s Circle of Transformational Practice on October 12th 9:30-11:30am at Threshold, 2717 Atwood Ave. Stephanie, Julie, and their colleague Nola Walker will share some of what they learned at Kelvy Bird’s Workshop in April.